Amy Lobben is an associate professor in the Department of Geography at the University of Oregon. Along with many other significant changes ushered in by the new millennium, maps and map-related products have seen unprecedented growth and availability. Millions of Google maps are used each day. Free online mapmaking software is available, creating a torrent of novice mapmakers. With all of this bounty of map-related products and services comes over two thousand years of cartographic history that has produced widely-available prescriptive and standardized guidelines for map design and production. Along with these guidelines, cartographers have devoted considerable effort to categorizing maps based on how the map is used and the type of data represented. This paper identifies some key advances that have been made over the past two thousand years of cartographic history and argues for the incorporation of some of these advances into the area of tactile map design and production. The basic tenet of the argument is that we should not ignore the long and rich cartographic tradition or the findings and repeated successful applications that have come from it. We should not assume that cartographic theory and methods do not apply to tactile maps because the foundations of cartography are not focused on a single type of map. The cartographic process considers different map-reader groups and their different needs, the type of map, the data available, and the production method used. The underlying cartographic communication process is not geared to any one type of map or any one user group. Therefore, both tactile mapmakers and tactile map-readers are included in the process, the theories, and the methods. But cartography will not come knocking on the door of each mapmaker. Rather, it is up to the tactile map community to exploit the cartographic process and methods and apply them to enhance effective tactile map design and production. The following sections present the cartographic communication process, some of the key universal principles of all map design, arguments for how these principles can be included in tactile map production, and finally, a brief description of tactile map and mapping resources that are built on cartographic principles. Cartography is one of the oldest disciplines in academia, tracing its beginnings back to the first formal teachings and publication of textbooks during the time of the ancient Greeks over 2,000 years ago. During the course of this rich and long history, cartographers have focused on a myriad of map and mapping issues, including map design, production, and use. One of the principles of cartography is that a map is monumentally different than just a graphic. Maps have meaning. They tie us to a location, whether familiar or unknown. The human brain processes map information differently than it processes other graphic information (Lobben et al. 2014). As a result, it is patently incorrect to assume that one can apply the same design guidelines to a map as one applies to a non-map graphic. While many maps are designed as art (consider the paintings Johns’ Map and da Vinci’s Map of Central Italy), most maps are designed and produced for a more utilitarian purpose. Maps represent something, often a portion of the real environment or a collection of data or ideas within that environment. The map user often must interpret qualitative and quantitative data represented on the map as well as the symbology that is actually representing those data. This sounds relatively straightforward, but map reading is a complex task, one that requires the reader to interpret the meaning of symbols and then understand the spatial distribution of those symbols. Sometimes the spatial distribution focuses on tangible features such as a street network and other times the spatial distribution focuses on intangible phenomenon such as population density. The job of the mapmaker is to understand the data that are being represented and then to choose the most appropriate mapping method. Hundreds of textbooks have been written to guide the mapmaker in the process of choosing the appropriate mapping method. The method and the overall map design affect how well the map will be interpreted by the map user. One of the goals of production cartography is to make the map use process as efficient and effective as possible. Along with textbooks, academic cartographers have published thousands of research reports, which together build a body of knowledge that informs the cartographic communication model. This model is represented in Figure 1 below. Figure 1: Cartographic Communication Model. Adapted from MacEachren, 1995. 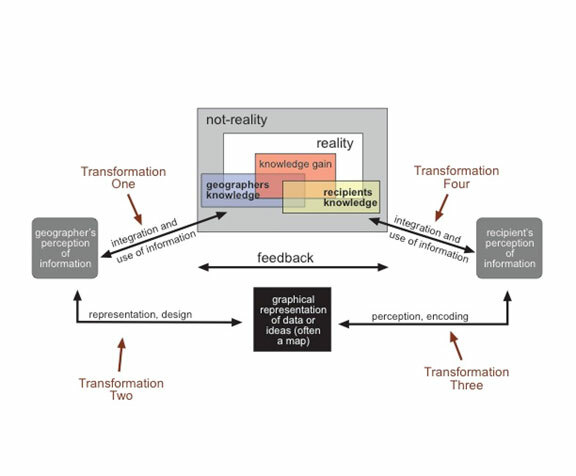 The model represents four stages of information transformation. An astute map-reader understands that a map itself is not reality. Rather, it represents a mapmaker’s interpretation of reality, which is transformed throughout the entire communication process, beginning with actual reality and proceeding to the mapmaker’s internal interpretation, the tangible representation of that interpretation (the map), the map-reader, and finally to the map reader’s interpretation of reality. In the end, a map-reader has an understanding of the reality that is often substantially different than the actual reality that was originally interpreted by the mapmaker. This difference in reality is not bad, unless the mapmaker is unaware of it. The cartographic communication model is designed to help mapmakers understand the significance of the mapping process, the importance of their decisions, and how those decisions will affect the map-reader’s knowledge gain. How will the information be selected, generalized, and simplified? How will figure ground relations be developed (i.e. how will the most important information be highlighted without overriding the other relevant information)? Furthermore, this is the stage in which a thoughtful cartographer makes choices that result in enhanced learning by the map-reader. Finally, it is also the stage during which the naïve cartographer assumes that the map-reader will intuitively understand the mapmaker’s representation, thinks the same way as the mapmaker, will use all of the information on the map, and will not miss the information that was omitted. While Stages One and Two focus on the mapmaker, Stages Three and Four of the model focus on the map-reader. During Stage Three, the map-reader perceives and encodes the geographic information from the map. The map-reader uptakes the information through sensory channel(s) and mentally organizes the information in a way that is meaningful to them. Subsequently, at Stage Four, the map-reader uses the geographic information to complete some task (e.g. navigating with a street map or understanding the spatial distribution of population density in the United States). Finally, the model contains a feedback arrow, which represents the connection between the four stages of the model. Sometimes, this connection is actual and applied. In other words, sometimes the mapmaker actively involves the map user or representatives of the map user group in the mapmaking process. At other times, the connection is less active. While past cartographic activity focused mainly on mapmaking, represented as Stages One and Two in the model, cartographers now know that the map user plays a pivotal role in the process. After all, even though most maps are made to be consumed by a map-reader, the maker and the reader are not usually the same person. Beginning with the iconic Look of Maps (Robinson, 1952), research foci such as perception, cognition, and neurobiology provide a fuller picture of how the map user processes and uses map information. Many of the map design guidelines that are now applied in the mapmaking process developed from this body of research. These guidelines are designed to facilitate more meaningful and efficient map reading. As a result, a well-designed map is often almost intuitively processed by the map-reader. While some maps are designed with aesthetics as a primary goal, the truth is that when a map is well-designed, the map-reader doesn’t even notice the design. In other words, the map-reader focuses on the geographic information in the map and not how well or poorly that geography is represented. The process breaks down when the map-reader doesn’t understand the symbols, the arrangement, or the overall distribution. To avoid this breakdown, cartographers advocate the use of cartographic conventions and/or standardization. For example, map users who are sighted benefit from conventional and standardized map symbols. Federal mapping agencies, such as the United States Geological Survey (USGS), apply very prescriptive map symbology standards. As a result, people who read topographic maps can rely on the systematic application of map symbols. For example, elevation is always represented by a thin brown line. The end result is that readers of topographic maps can focus on understanding the geography in the map and not on understanding the symbology or design. The USGS mapping standards are a brilliant example of how the cartographic communication model is implemented to enhance effective and efficient map-reading. Private mapping companies, such as the historic Sanborn Mapping Company or modern-day Rand McNally, are also prescriptive about their symbol use. While they don’t use the same standards set by the USGS, they do adopt cartographic conventions. For example, if a map-reader identifies a blue polygon in the middle of a state, without having to consult the legend, they know the blue polygon represents water. The difference between cartographic standards and cartographic conventions may seem only an issue of semantics. In practice, the difference manifests itself in subtleties and flexibility. Moreover, the map utility and map audience have affected whether the mapping agency or company has adopted rigid standards or applied cartographic convention. As an example, the cartographic standards adopted by the USGS and the early Sanborn maps, resulted in rigid rules applied to every map for literally decades. Their maps are very utilitarian. The historic Sanborn maps were created by the Sanborn Company as fire insurance maps. Thousands of these detailed urban land use maps were created for about 100 years beginning in the late 1860s. During that entire production time, the mapmakers held to rigid standards that applied to design, scale, and production. As a result, like the USGS topographic maps, every map is systematically designed. In contrast, large volume map production companies such as Rand McNally, are mass consumer-oriented. As a result, even though many people may purchase a road map for utilitarian purposes, for-profit mapping companies are also focused on aesthetics. And, like other production sectors, maps have had their own history of fashion and aesthetics. But, again, the issue is one of subtleties in application. Overall conventions are still applied (i.e. water features are blue, roads are black, and urban areas are designated with a slight shading). Aesthetically-driven changes throughout the decades resulted in the use of different shades of blue for water or different thicknesses of road lines. In general, dramatic changes are not made and the map-reader can still pick-up nearly any road map and use it without having to consult the map key. This paper focuses broadly on standards, conventions, and different uses of maps. It is therefore important to distinguish between map types. As disciplines mature, scientists synthesize knowledge and develop typologies, ontologies, and models. Cartography is no different. While cartographers have developed different types of maps, two general categories exist. The categories, referred to as reference maps and thematic maps, are differentiated based on how the maps are used and the type of information they represent. Reference maps are typically larger scale (i.e. show less geographic area and more detail) than thematic maps. Reference maps represent permanent environmental features, both natural and anthropogenic. In other words, these maps show the location of tangible features, such as roads, rivers, buildings, or sidewalks. These maps are often used to identify environmental reference points. Two common examples are the USGS topographic map discussed above and a common city street map, which is often used for goal-oriented travel (i.e. to get from one location to another). Street maps provide more than simple you-are-here information and enhance spatial relations skills by requiring the user to develop understanding of relative and absolute spatial locations of features (i.e. distance, direction, sequencing, etc.). Street maps also serve as aids to a person who needs to travel through a real-world environment. During the map use process, maps provide an essential layout or reference point by which the traveler registers landmarks (which are recognized through kinesthetic, auditory, tactile, or olfactory cues) as encountered during environmental exploration. These maps provide a valuable resource for travelers that are accessing an unknown or less familiar area. Researchers have discovered that the task of traveling through and learning an environment may be completed much more efficiently and easily if map users who are blind or low vision use a tactile map before and during route navigation (Blades, Ungar, & Spencer, 2000; Espinoas & Ochaita, 1998; Golldege, 1986; Loben & Lawrence, 2012; Passini & Proulx, 1998; Spencer, Morsley, Ungar, Pike, & Blades, 1992; Ungar, Blades, & Spencer, 1996, 1997). In the other category, thematic maps are those that represent data or themes such as population or income. These maps provide an important tool in the education about and understanding of geographically distributed phenomena. The teaching materials used in science and social science classes for students who are sighted nearly always include a variety of maps. However, the same educational materials simply are not used to the same extent by students who are blind or low vision. A limited number of maps at very general geographic levels may be obtained, but these limited materials preclude an adequate representation and therefore an adequate teaching of United States’ socioeconomics. Maps representing country-level and individual state-level patterns in a variety of socio-economic areas (e.g. population, age, gender, economics, education, etc.) are central to understanding American culture, politics, economics, and society. For ten years, we have been working on bridging the needs of tactile mapmakers and users with the existing cartographic map production infrastructure. Years of in-depth interviews, surveys, and needs assessments have revealed three primary shortcomings for tactile mapmakers and users. First, cartographic conventions are not widely applied. While small groups, such as a single group of orientation and mobility practitioners, may use the same symbols to represent the same features on a map, these customs are not common or systematic throughout the United States. Second, tactile map production software is not widely used. In contrast, digital mapping for sighted map users is a huge and still booming sector of our economy. Much of the explosion and extensive use is due to popular tools such as Google Earth, Google Maps, Yelp, and many other Internet map-based services and digital products. All of these services and digital products are based on maps, mapping, spatial analysis, and geographic databases. The result is an almost overwhelming availability of mapping software, geared to producing maps for users who are sighted. A shocking dearth of such software exists for tactile mapmakers. Moreover, software that is specifically targeted for tactile mapmaking is not widely used. The result is a completely inadequate availability of tactile maps, which needs to change. Third, while literally millions of thematic maps are available for free download by and for map-readers who are sighted, the same is not true for tactile maps. This also needs to change. The sections below address these three issues individually, documenting what we have done to begin addressing each need and providing the beginning of a discussion on how the tactile mapping community can begin to meet these needs in a more meaningful way. At the end of the section, we provide a brief description of where and how all of the tactile mapping resources are freely available for public access. The term convention refers to the usual way of doing things, which means that cartographic conventions describe an approach to map design that adheres to some basic, repeated guidelines. These guidelines apply to several map elements such as title, map scale, legend/key, text size, text placement, and symbols (including selection, design, and placement). The use of cartographic conventions results in building predictability and familiarity for the map-reader, allowing them to focus on the map content rather than the map design. Therefore, a key issue for developing cartographic conventions for tactile maps is repeated and long-term research that informs what the conventions should be. This research cannot focus on all conventions immediately and simultaneously. As a result, our research team chose to begin this process by investigating tactile map symbol conventions. We chose symbols as the first focus since they are the features that represent the geographic reality and data. They contain meaning that must be deciphered and transformed by the map-reader. If the same feature (a symbol representing water, for example) differs from tactile map to tactile map, then every time a tactile map-reader picks-up a new tactile map, they will have to spend time studying and comparing the map key to the map itself, rather than attending to the geography in the map. We engaged in a 5-year research project in which we empirically designed and tested a set of tactile navigation map symbols (Lobben & Lawrence, 2012). The initial symbol set was built on findings from previous research (Campbell, 1997; Coulson, 1991; Eriksson, 1999; Heath, 1958; Lambert & Lederman, 1989; Morris & Nolan, 1961; Nolan & Morris, 1971; Perkins, 2002; Rowell & Ungar, 2003; Wiedel, 1966). We conducted a year-long international survey that identified the environmental features that are most used during navigation and way finding by travelers who are blind or low vision. The tactile navigation map symbol set, represented in Figure 2 below, paired the most salient features with the most discriminable symbols. 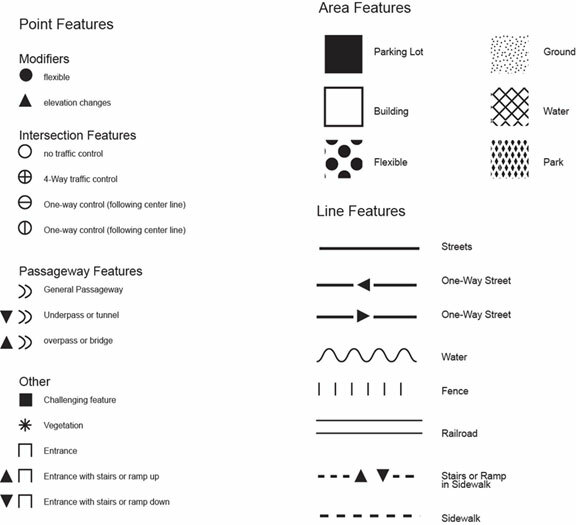 This figure includes twenty-eight tactile symbols that represent common street network features such as roads, sidewalks, types of intersections, entrances, terrain changes, parks, water. This symbol set is available for download and tactile printing from our resources website discussed below. Subsequent years of repeated user testing resulted in a valid and reliable set of symbols for tactile navigation maps. To be clear, we are not suggesting that these symbols are the standard. Only federal mapping agencies have the authority to standardize map symbols. Rather, we posit that our five years of systematic research reveals that these symbols are discriminable, easy-to-use, and could provide the foundation for tactile map symbol conventions. Please see Lobben and Lawrence (2012) for a complete description of the symbol set design and field testing. Travel is a fundamental human activity. Usually travel is conducted from and to locations that are familiar as part of repetitive daily activity, such as going from home to work, store, or school. Although sometimes a person needs to travel to a previously unknown location, such as to a new physician, a meeting, or an entirely new city, repetitive daily travel likely is not conducted with the aid of a map; however, travel to new locations may be more effective and efficient with the use of a map. So, where does a person get a printed map? Ten years ago, most street maps were still printed and acquired from mapping companies, tourist agencies, or government agencies. Today, most printed maps are made and printed individually through online map sources, such as Google Maps. Comparatively, tactile maps, which are used by travelers who are blind or low vision, can be difficult to obtain. This difficulty is due to a combination of factors, which include production expense, production difficulty, low buying power, and too few people who have access to and expertise for production (Dahlberg, 1997; Perkins & Gardiner, 1997; Sierkierska et al. 2003). Support for and access to tactile maps is inadequate. This lack of access and support results in the virtual non-use of tactile maps, which can be beneficial not only for individual recreational travel, but also for orientation and mobility training. Currently travelers and teachers have two methods for acquiring tactile maps. One method is the purchase of the map from an individual or tactile map production company. Often these maps are expensive and may be long in delivery due to customized orders and too few producers. Another method is to produce the map by hand (e.g. collage, etched or hand-drawn microcapsule maps). These production processes are laborious and result in single-production maps which are not ideal for repeated use in tasks like orientation and mobility lessons. Fortunately, access to production equipment for microcapsule production and other methods of map production is not a significant issue for many people—especially teachers—who need to produce tactile maps. But while production hardware is available, the means to put this hardware to use for tactile map production may still be elusive for many people. To address the issue of the absence of software designed specifically for the production of tactile maps, our lab (the Spatial Computation, Cognition, and Complexity – SC3 lab) created Tactile Map Editor (TaME). TaME allows users to create customized tactile maps of any environment (indoors or outdoors). The software was designed with two primary goals in mind: optimal map production (i.e. embed cartographic principles) and support of non-expert end users. In other words, we wanted to ensure that a person with minimal to no computer design experience or cartographic expertise could produce an optimally designed tactile map. We included software features such as: (a) profile manager which allows users to create different accounts for different students, and save/edit/print custom maps for each account; (b) embedded Smart Design tools which include tactile map design tips, a constraint-check tool to confirm tactual discriminability, an embedded drag-and-drop navigation symbol library, a symbol library plug-in for customized symbols, and a digital basemap import (from Google Maps or Yahoo Maps, for example); and (c) roving print window that allows users to move the print window and select a portion of the map for printing. Though the TaME software was designed for novice users, a tutorial is still helpful to give new users a guided tour of the software. We spent two years writing, systematically testing, and revising an illustrated software tutorial. During that process, we conducted five testing sessions and focus groups. These sessions allowed us to iteratively develop, edit, and enhance the tutorial. Following each session, we revised the manual and/or the software and conducted a follow-up test session. Examples of session outcomes are shown below in Table 1. The resulting tutorial can be used individually or with a group setting and is available for free download from the website discussed below. As briefly defined above, thematic maps represent the distribution of one or more data variables or themes (i.e. political maps, economic maps, or natural resources maps). These maps are often used to enhance understanding of content areas of science and social science education. Unfortunately, the limited access to socio-economic tactile maps means that a teaching tool that is readily accessed and used in comparable mainstream education is less available for students who are blind or low vision. While reference/street maps contain symbols that represent discrete features qualitatively, thematic maps often display quantitative classes of theme data. For example, a population map of the United States broken down by state would include fifty data values. Years of empirical cartographic research has revealed that the most understandable classification system yields up to seven individual classes of a single data set. Therefore, rather than displaying fifty unique symbols with each representing a discrete state value, the cartographer would likely mathematically separate the data into distinct classes. While visual thematic maps have been studied in depth, tactile thematic map research is nearly non-existent. To address this lack, our lab developed and empirically tested tactile thematic data class symbols (Lawrence & Lobben, 2011). We then applied those class symbols and created hundreds of tactile socioeconomic maps. 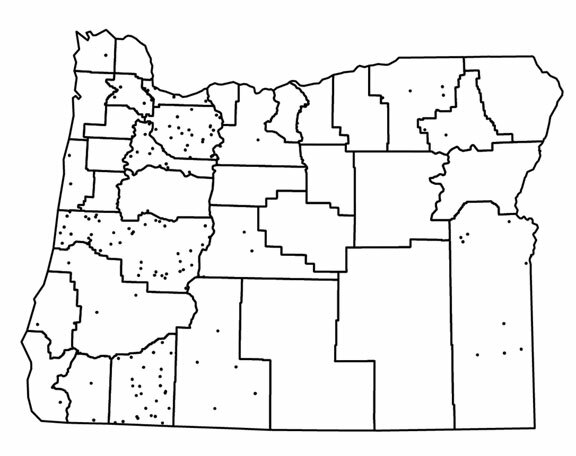 Figure 3 (below) shows an example of a population map of Oregon. This map displays three categories of population distribution, represented by increasing dot density patterns. Figure 3, as well as hundreds of other examples, is available for download and tactile printing from our resources website discussed below. Using data from the United States Census Bureau, we created several types of maps for each state in the United States, including maps displaying population, education level, and income level. We also created two types of blank outline maps, one with county boundaries and one without. We applied line generalization algorithms to simplify the outlines in order to remove tactile ‘noise’ and enhance discriminability. The maps are organized by both state and theme. For example, a teacher can download all maps of a single state, which would include the outline maps, population, education, and income, or the maps can be organized and downloaded by theme, allowing a person to access all state maps of population distribution. All of the resources discussed above are available online at http://geog.uoregon.edu/maps. The resources, without exception, are all freely available for download. In the case of the software tutorial and all maps, the files are in regular PDF format, which can be directly printed to any tactile production method that accepts PDF files. The TaME software is an executable file (a computer program). Individual computer systems will affect the download process. For example, in many educational settings, permissions are established by system administrators, who may need to help or conduct the download. The software is a fairly straightforward download, but additional instructions are included in the TaME tutorial. Tactile map production can be an arduous process, mostly because nearly every stage of the process is complicated, both theoretically (as revealed in the cartographic communication mode) and mechanically (due to the lack of available production resources). Prescriptive and systematic use of map symbology originated due to a single reason: the map user should focus on learning the geography rather than having to focus on re-learning the symbology every time a new map is encountered. This report was written with three goals in mind. The first goal was to identify the cartographic communication process and some of the cartographic conventions that have been systematically developed, tested, and applied to maps throughout the two thousand years of cartographic history. Second, this report argues that the tactile mapmaking process and tactile map-readers may benefit from the cartographic communication process and subsequent map conventions. Third, the report outlines several projects (along with their free availability) undertaken in an effort to investigate potential tactile map conventions. Discovery is an iterative process which requires time, patience, and knowledge sharing. One approach to developing tactile map conventions is to start from scratch, providing a long, open road in the process of discovering the ideal conventions. Another approach is to exploit discoveries already made by mapmakers and convert those discoveries into tactile map conventions. The cartographic communication process is supported by continuous work over millennia. Although the process is systematic, it is also flexible. Blades, M., Ungar, S. & Spencer, C. (2000). Map use by adults with visual impairments. The Professional Geographer, 51, 539-553. Campbell, J. (1997). A code for reducing figure-ground ambiguities in tactile graphics. Journal of Visual Impairment and Blindness, 91(2), 175–81. Coulson, M. R. (1991). Tactile-map output from geographical information systems: The challenge and its importance. International Journal of Geographical Information Systems, 5(3), 353–60. Dahlberg, M. (1997). Tactile mapping: An unusual GIS application. In Ottoson, L. (Ed. ), Proceedings of 18th ICA/ACI International Cartographic Conference, 3, (pp. 1417-1421). Stockholm, Sweden: Swedish Cartographic Society. Eriksson, Y. (1999). How to make tactile picture understandable to the blind reader. Paper presented at the 65th Annual IFLA Council and General Conference Bangkok, Thailand. Espinosa, M.A., & Ochaíta, E. (1998). Using tactile maps to improve the practical spatial knowledge of adults who are blind. Journal of Visual Impairment and Blindness, 92(5), 338-345. Golledge, R.G. (1986). Sensitivity to perspective structure while walking without vision. Perception, 15, 173-188. Lambert, L., & Lederman, S. (1989). An evaluation of the legibility and meaningfulness of potential map symbols. Journal of Visual Impairment and Blindness, 83(8), 397–403. Lawrence, M. M., & Lobben, A. (2011). The design of tactile thematic symbols. Journal of Visual Impairment and Blindness, 105(10), 681-691. Lobben, A., Lawrence, M., & Pickett, R. (2014). The map effect. Annals of the Association of American Geographers, 104(1): 96-113. Lobben, A., & M. Lawrence. (2012). The use of environmental features on tactile maps by navigators who are blind. The Professional Geographer, 64(1), 95-108. MacEachren, A. (1995). How maps work: representation, visualization, and design. New York: The Guilford Press. Morris, J. E., & Nolan, C. Y. (1961). Discriminability of tactual patterns. International Journal for the Education of the Blind, 11, 50-54. Nolan, C. Y., & Morris, J. E. (1971). Improvement of tactual symbols for blind children: final report. Louisville: American Printing House for the Blind, Inc.
Passini, R., & Proulx, G. (1988). Wayfinding without vision: An experiment with congenitally totally blind people. Environment and Behavior, 20(2), 227-252. Perkins, C., & Gardiner, A. (1997). What I really, really want: How visually impaired people can improve tactile map design. In Ottoson, L. (Ed. ), Proceedings of 18th ICA/ACI International Cartographic Conference, 4, (pp. 1159-1166). Stockholm, Sweden: Swedish Cartographic Society. Perkins, C. (2002). Cartography: Progress in tactile mapping. Progress in Human Geography, 26(4), 521–530. Robinson, A. (1952). The look of maps. Madison, WI: University of Wisconsin Press. Rowell, J., & Ungar, S. (2003). The world of touch: Results of an international survey of tactile maps and symbols. The Cartographic Journal, 40(3), 259–263. Ungar, S., Blades, M., & Spencer C. (1996). The ability of visually impaired children to locate themselves on a tactile map. Journal of Visual Impairment and Blindness, 90, 526-535. Ungar, S., Blades, M., & Spencer, C. (1997). Strategies for knowledge acquisition from cartographic maps by blind and visually impaired adults. The Cartographic Journal, 34(2), 93-110. Wiedel, J. W. (1966). Tactual maps for the visually handicapped: Some developmental problems. The Professional Geographer, 8(3), 132-139.